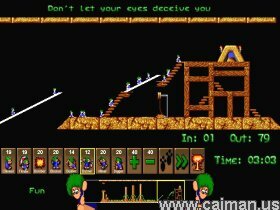 Caiman free games: Lemmins by Geoff Storey. A beautiful remake of the classic puzzle game orginally developed by DMA Design and published by Psygnosis in 1991. This remake contains all orginal levels + the Oh No levels. 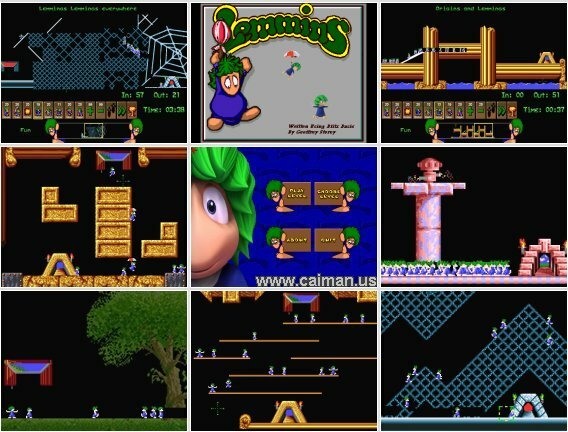 By Lemmins each level comprises both destructable landscape elements such as rocks, instructable sections such as steel plates, and include numerous obstacles including chasms, high walls, large drops, pools of water or lava, and traps that trigger when a lemming is close. Each level also includes one or more entrance points and one or more exits. The goal is to guide a certain percentage of the green-hair, blue-shirted lemmins from the entrance to the exit by clearing or creating a safe passage through the landscape for the lemmins to use. Unless assigned a special task, each lemmin will walk in one direction ignoring any other lemmin in its way (save for Blockers), falling off any edges and turning around if they hit an obstacle they cannot pass. They die if they fall from a great height, fall into water or lava or off the map, or get caught in a trap; they also die after being assigned the bomber skill. * "Floaters" can safely fall off from heights without injury. * "Bashers", "Miners", and "Diggers" cause the assigned lemmin to dig across, diagonally downward, or directly downward, respectively, through destructable material until they emerge into open air, hit indestructible material, or are reassigned. * "Builders" create a rising stairway. * "Blockers" will reverse the direction of all lemmins that hit them, and cannot be reassigned unless first the ground under their feet is removed. * "Bombers" will continue whatever they were doing prior to assignment, but after 5 seconds (indicated by a countdown timer above their head) they will stop and explode. The lemmins are released at a rate predetermined by the level (from 1 to 99), but the player can increase this to a faster rate once they've cleared a path for safe passage to an exit. 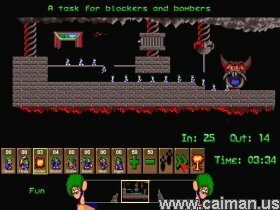 The player also has the option to "nuke" all the remaining lemmins on the screen, converting them all to Bombers, either to quickly forfeit in order to retry a level or to remove any Blockers that remain after the rest have been rescued.